The recent holiday season was not our finest. All of us were sick off and on, with varying degrees of seriousness; for my part, I was pretty much knocked out with illness two separate times over the ten day span. And leading up to Christmas I did a bad job focusing on what Leah wanted, so my presents for her were not what she was hoping for. The boys had plenty to unwrap. Harvey made some sweet gifts for his brothers, including the stuffed blue triangle with eyes and a smiley face that Lijah desperately wanted (plus a house for it to live in!). I made Zion his bow and arrow. And there were lots of legos. We opened some here at home, then headed for my parents' house for the rest, and for the assembly phase. There was also a fire to sit by and plenty of delicious food, starting with brunch and going continuously from there through supper. We sang some songs to work off the calories. My brother and his family came up on the 27th, so on Friday we had a second Christmas celebration with them: more of the same, only even more relaxed. Thankfully there weren't too many more presents to open, since Harvey and Zion at least felt by the afternoon of the 25th that they'd gotten more than they ever wanted. It can be a little overwhelming. All they really wanted was to play with their cousin Nisia—and meet their baby cousin Esther! We did those things. I had thought of having a New Years Day brunch, but then we got an invitation to spend the day with my cousins, who we barely ever see. So I figured we could do a New Years Eve brunch instead. There was plenty of food and plenty of board games. When everyone got tired of our house we all moved on to the next event, a pot-luck supper at our friends' house. There was more food and more board games, plus Super Smash Bros for the kids. All was perfect except that I was too worried my fever would come back to be able to have a drink. Never mind, that meant I was sharp enough to completely dominate a game of Stone Age. The competition was all-consuming, so I was pretty surprised when we finished up and I noticed it was already 9:30. Yikes! More than late enough for us, so we went home and went to bed. New Years Day the cousins cancelled on us, after hearing about the plagues we were suffering (Nisia came down with a fever New Years Eve). Since she already had all the food, my mom invited us to come anyways; since I had already made two quiches, I said sure. At least this time we took a walk. The kids had fun, even if they chose not to show it in pictures. All in all we had a pretty good time, but we're also glad to see the tree come down and the schedule go back up on the chalkboard. All that eating and relaxing is hard work! 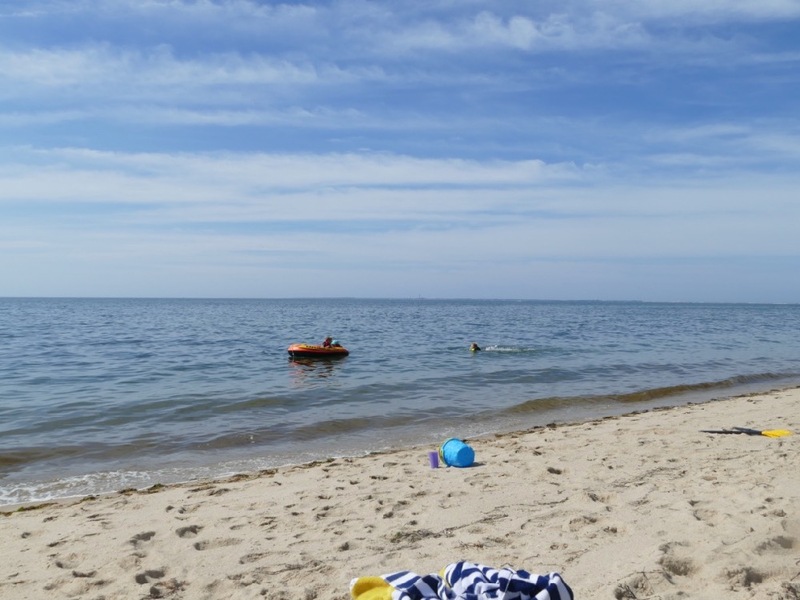 I said I was waiting until I had time to think, but that may never happen; so on a day when the temperature started out in the mid-30s it feels like a great time to revisit our last big beach trip of the summer. Leah's cousins(ish) Marcy and Joel live in Sandwich on Cape Cod, and a couple weeks ago they invited us down for an overnight. We've been before, but not for a while and never for more than an afternoon. So when we had an opening in our busy schedule, we went for it! Aside from getting to spend some time with lovely people, we do like visiting the sea. Or, you know, whatever's handy. Sandwich is closer than we thought, and we got there well quicker than we expected, leaving us time to explore before our hosts expected us. It turns out that the town is the historic center of the Cape, and plenty of that history has been preserved. Like the gristmill, which was too expensive for us to visit; luckily we could see pretty much all we needed from beyond the fence. do they make sandwiches there? Just as interesting to all of us was a big tree on a little town green, which looked eminently climbable. By the time we got done amusing ourselves there, the time specified in our invitation had arrived, so we piled back in the car and got to our hosts' home just in time to enjoy an enormous lunch. As we digested they offered us a list of entertainment options, but we had ears for just one: the beach! It had been raining as we packed up in the morning, and clouds still lingered in half the sky as we made our way to the water—which meant that the afternoon light was just beautiful. I took about fifty pictures right there. Of course, we also enjoyed the beach in more direct ways. Leah swam, and the bigger boys an I played in the waves which, while smallish, were enough to entertain. Lijah is really not feeling the sea-bathing this year—"I don't like the ocean," he'll tell you whenever the subject is even mentioned—but he enjoyed digging in the sand. And even he eventually figured out a way to get into the water. After about 17 hours on the beach we headed back to the house for dinner. While Joel was doing the grilling we hung out by, and in, the pool. Zion eventually went in the water, but he needed to rest up a bit first. Just after I took that picture I asked him if this was the life. "It would be if there were some food here," he answered. Luckily in that house lots of good food is never far away, and mere minutes later we were treated to a delicious dinner of "something from the sea", as per Harvey's request. Harvey's other request was to go mini-golfing, and after a tough night (in which Zion fell off the bed onto Harvey's head, among other disruptions) and an abundant breakfast, we we went to Pirates Cove Hyannis to reprise our delightful experience in Bar Harbor. For some reason I didn't take any pictures, but I have to note for the record that Leah won this time, convincingly. Then we went to the beach again—well, a different beach. We shared a tremendous picnic—you sense a theme here—then took to the water. It was a hotter day and we were all pretty tired, so mostly we just lounged in the water or under the umbrellas. That and picked up rocks. The blue bucket came along again, so of course Lijah went in it again (if you're interested, Marcy and I probably have about 200 photos of him). As we were getting ready to go Zion got in on the act too. It looked like so much fun we all would have loved to have a go... sadly, from Harvey on up we'd need a bigger bucket. Still, when that's the only thing that could be improved you know it's a pretty good time! Thanks Marcy and Joel for inviting us for one last wonderful weekend of summer—now to remind us of warmer days as we head into winter we've got these pictures, and our rocks. Lots and lots of rocks.